Following a brilliantly promising pre-season, Douglas Costa kept his place on the starting 11 in the wide left position in a game where Bayern showed some issues in their possession game despite Pep’s attempts to amend it. The formations for the start of the game, though Bayern in particular were soon to change. Unsurprisingly, Manu Neuer started behind a back 4 of David Alaba, Phillip Lahm, Medhi Benatia and Jerome Boateng. The defensive chain in particular played an interesting and unusual role for the Bavarian build-up of possession. In front of them sat Xabi Alonso who played his usual role of trying to support the circulation of the ball, mainly through long diagonal passes to either wing. However, unlike last season the Spaniard rarely dropped between the two centre-backs and instead stayed in the 2nd line. In what was loosely a 4-1-4-1 formation, Vidal and Robben took up the central midfield positions but the latter didn’t spend long there whilst they were flanked by Costa and Muller respectively. Lewandowski was the lone striker, making some dropping movements and getting his name on the scoresheet in the 53rd minute with the second goal of Bayern’s 5-0 rout. In opposition, HSV defended in a 4-5-1 formation which for the most part was quite stable as they sat deep without the ball and were compact in the centre. This emphasised the access issues which Guardiola’s team had, particularly early on, as they were often resorting to weaker wide developments. Rene Adler was the goalkeeper behind a 4-back defence of Diekmeier, Djourou, Spahic and Ostrzolek. Ahead of them sat a tightly-knit 3-chain in midfield, consisting of Jung, Ekdal and Lewis Holtby. Ivo Ilicevic and Michael Gregoritsch took to the flanks beside a lone striker in Sven Schipplock who received poor support from the HSV midfield. The poor attacking play from Hamburg was a sizable issue as it created no pressure against Bayern’s defence as they frequently played harmless long balls upon regaining possession. Bayern had issues in their build-up game, mainly due to the deep flat back 4. In the Bavarian early possession there was a somewhat strange positional structure, primarily across the back 4 as both full-backs stayed deep as the home side were bringing the ball out from the back. Ahead of this flat back four sat Alonso who didn’t drop between Boateng and Benatia like his usual orientation and instead played in a higher position where he was loosely marked by Sven Schipplock. The primary issue with the Spaniard however was the usual case in that he blocked the passing lanes of Boateng mainly whilst from his slightly higher role he rarely was found in a position where he could support the ball circulation effectively. Mainly because of this deep four-chain in the defensive line, Bayern had some significant issues in possession and they lacked connections and especially access to the centre. As a result their possession game struggled significantly with the ball frequently moving (and staying) wide as HSV defended relatively comfortably. In the left half-space, Vidal was relatively active and dropped to support against such issues (and much more increasingly so as the game progressed) though the same can’t be said on the right. With Robben in the half-space, he was somewhat inappropriate for the role required in supporting the movement of the ball as instead the Dutchman was much more direct. Due to the above issues, Bayern couldn’t utilise Robben very effectively either as he was often waiting on the half-space being opened for him to make his usual dribbles forward but access was poor for his teammates. The deep full-backs also had an impact on the orientation of the wide players higher up the field. Both Costa and Muller were playing roles which saw them high and rather wide as Alaba and Lahm respectively were not offering the usual positional support. Not only did this mean for some poor spacing on the wings with the full-back and wingers often disconnected but in a number of cases allowed Bruno Labaddia’s side to isolate the ball by the touchline. Through the opening stages of the game, HSV were quite happily sat deep without the ball, refusing Bayern access between the lines and emphasizing their issues with connections across the midfield. In midfield particularly they were compact and though the wide players created some defensive connection issues by being particularly oriented to the Bayern wide forward, Pep’s team weren’t adequately set up to exploit. Bayern’s shape following the change. With Bayern’s opening issues came some changes in the system as Pep looked to amend the problems found in possession of the ball. The first signs of changes could be found around the 10th minute mark as Muller became more oriented towards the inside whilst Robben was moving in the opposite direction. The real, more fixed changes came closer to the 20th minute however where it became much more clearer of a 4-4-2 with Robben wider and Muller supporting the connection game better alongside Lewandowski. The full-backs became much more advanced during Bavarian possession, Alaba in particular who was frequently driving inside into the left half-space. On the other side, Lahm was slightly less aggressive in his positioning and was more often closer to the touchline due to Robben’s orientation higher up the pitch. This theoretically would allow them to form connections better in the centre, allowing for an improved access though Bayern’s still had similar issues for the rest of the match. Then, later on in the game some rotations began to happen between Alaba and Costa on the left half of the pitch. Though I’m not entirely sure their intentions in this it may have been in an attempt to stretch the half-space to create access to Costa in an inside position where he can threaten in penetration. Their attacking strategy didn’t change greatly, as Douglas Costa maintained his wide-left position in anticipation of diagonal passes from the right. Pep’s team would bring the ball out from the right side of the pitch as they had excellent contributors to the possession game in Boateng and Lahm to then switch to the under-loaded side in an attempt to create the 1v1. Given his excellent passing range, this was usually executed through Boateng whilst Alonso attempted to do so too yet to a lesser effectiveness. Boateng himself began to drive forward with the ball on a more regular basis. Possibly to aid penetration into the HSV midfield with his passing ability whilst supporting the combinations from the right half-space. As Costa was on the touchline, Alaba would and Vidal would be situated nearby in the left half-space to maintain connections and a good spacing when the ball did reach the Brazilian, ensuring that if the 1v1 wasn’t possible, the ball wouldn’t be isolated by the HSV defence. Arturo Vidal’s role also changed somewhat through the game as he became more and more involved in a central role during early possession. Coming further inside from his left half-space, this allowed him to greater contribute to the connections in midfield and increase their central presence. Shortly following the change he could be seen at times as a situational left half back as his supporting movements provided a balance for Costa and the changed orientation of Alaba. Later on, Guardiola made the substitution of bringing Gotze on for Robben. 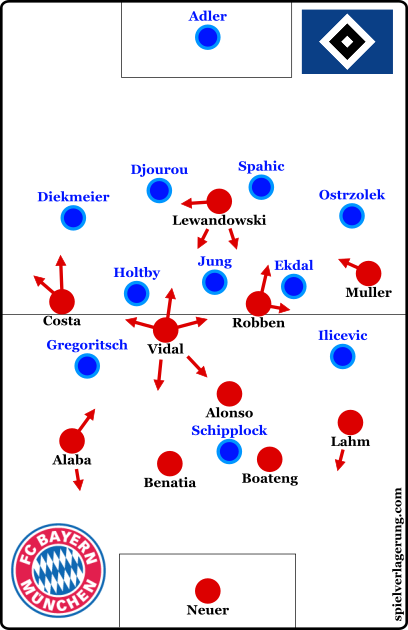 This brought about a slight re-structure of the system as Gotze moved to the left half-space whilst Douglas Costa shifted to the opposite flank. The ex-Dortmund midfielder had somewhat of a variable role which saw him move inside but also situationally deeper or wider to the touchline. He was supported well by Alaba who himself became more aggressive in his positioning (whilst being more wide too) with Thiago’s introduction. I don’t think the initial changes really improved Bayern’s possession game however as they still rarely managed to penetrate the HSV defence, relying on a Benatia set piece header to make it 1-0 as they went into half-time. The late goals also suggest the factor of fitness playing a part on HSV’s part as they were unable to carry out their defensive strategy, albeit if Bayern improved somewhat from the struggles they showed within the opening 15. Nice to see how much freedom Pep gives to Alaba and Lahm to get into dangerous areas from their outside back positions. This is one reason they are so fun to watch, to see how their players will not play in the positions they are lined up in. I imagine that Pep gives them freedom to go, while having others give balance when they go forward. Could you explain more about Alonso’s poor positionin in terms of cutting off passing lanes. Where exactly should he be during the build up phase? Is it between the CBs? Not necessarily between the CBs. It always depends on the situation. The postioning should at on hand make it easy for the CBs to play to him (a keyword here is “passing angles” and on the other hand make him an effective option to pass to. If he moves towards the ball when there’s no real pressure, the pass from the CB to him covers less space (means it’s less effective) than it would be the case if he had stayed in midfield. Vidal is a brilliant signing!